Jisoo, "A Sign of Great Success in the Middle of MV Filming"
Jisoo, a member of girl group Lovelyz, talked about a sign of success for their new song 'Now, We'. On the Naver V App live broadcast of 'Now, We' Comeback Countdown Show' on the night of May the 2nd, Jisoo said, "A fire broke outside and firecrackers went off," disclosing an episode in the middle of music video filming. She reassured fans by saying, "The firecrackers hit my shirt but I wasn't injured." She then delightfully said, "It's a sign of great success." A message said that Jiae's scene also had exploding flowers. Jiae said, "The cut was so pretty but it couldn't be used. The pillar fell in the shot." She explained, "I wasn't injured. The flowers that were there were hurt." 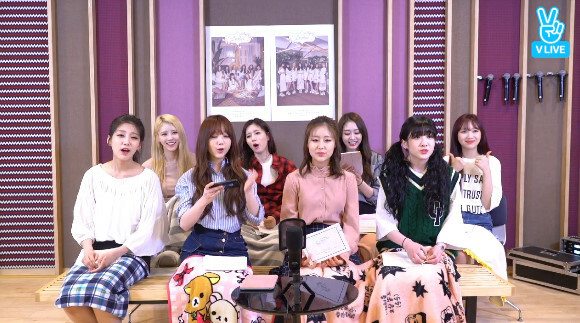 [OSEN, via Naver Entertainment] [V Live] Lovelyz's Jisoo "A fire broke out in the middle of MV filming..A sign of great success"
[+591 | -122] I'll always support Lovelyz. Fighting, fighting!!! [+452 | -111] Lovelyz's 'Now, We', let's hit it big!! [+104 | -22] I'm glad that they're not hurt on their way to hitting it big..
[+95 | -23] You'll hit it big!! Lovelyz, fighting!! [+72 | -19] Let's definitely hit it big!! !